Christians believe that the Fall is only part of humanity's story, and that it is essential to understand the role of Jesus' sacrificial death in salvation. These ideas make little sense if the Fall totally ruined humanity. Many Christians believe that continiuing free will is a necessary part of being human. This idea goes back to the time of Augustine. Pelagius was a British Christian who visited Rome and was apalled by the openly sinful behaviour he witnessed. This explained why Augustine was obsessed with sin, Pelagius thought. It also showed how unhelpful Augustine's teaching was. The belief in Original Sin, that we are born sinful and there's nothing we can do about it, lead people to give up trying to be good. Pelagius believed that the idea of original sin was unfair - why would God punish future generations for Adam's sin? Moses taught that ‘Parents are not to be put to death for their children, nor children put to death for their parents; each will die for their own sins.’ Deuternomy 24:16. Pelagius sees this reflected in the Old Testament, where the Jewish people sometimes get it completely wrong, then they repent and get it right, and God forgives them. He also thinks that the commandments of God only make sense if we assume people have free will. Why would God give commandments to people who he knew couldn't follow him? Pelagius also made the point that when we could do the wrong thing but instead choose the right thing, then we are being truly good. God guides us, but we choose whether to listen to God. Pelagius completely disagreed with the concept of the elect. He said that Jesus died for all people (universal atonement) and that anyone who freely chooses to have faith in Jesus will be saved. Arminius lived over 1,000 years after Pelagius, but had very similar views. He disagreed with the idea of predestination, thinking that this would make God responsible for all the evil acts of humanity. Arminius was born shortly before Calvin died, and when he studied theology, it was at the height of the Protestant Reformation. Some of his teachers were staunch Calvinists, but there were others who were already questioning some of the implications of Calvinism. For example, Kolmann taught that by focusing on God's sovereignty above everything else, Calvinists made God into a "tyrant and an executioner". Arminius rejected Calvin's notion of predestination. It makes us merer automatons, rather than being in God's image. Also, if Calvin was right, and we were controlled by God without having any real free will, then God must be responsible for all of the evil in the world. Arminius couldn't accept this, as it doesn't fit with God's loving nature. "...everything in man, the understanding and will, the soul and body, is polluted and engrossed by this concupiscence." Institutes, Vol. I, Bk. II, Chap. 1, Para. 8; Allen translation. This has been called 'prevenient grace', and describes God's love for humans that precedes their decision making. Unlike Calvin, Arminius thinks God is helping us make the right choice, not forcing us to do something against our will. Arminius agree with Calvin that God chose some people for salvation. However, Arminius thought it would be unfair for God to randomly choose some people to be saved. Instead, he taught that God had foreknowledge of who would choose to accept salvation. Try writing out a comparison of Augustine, Calvin, Pelagius and Arminius. You need to be really clear about the points they each agree and disagree on. (b) How convincing are religious views on free will? 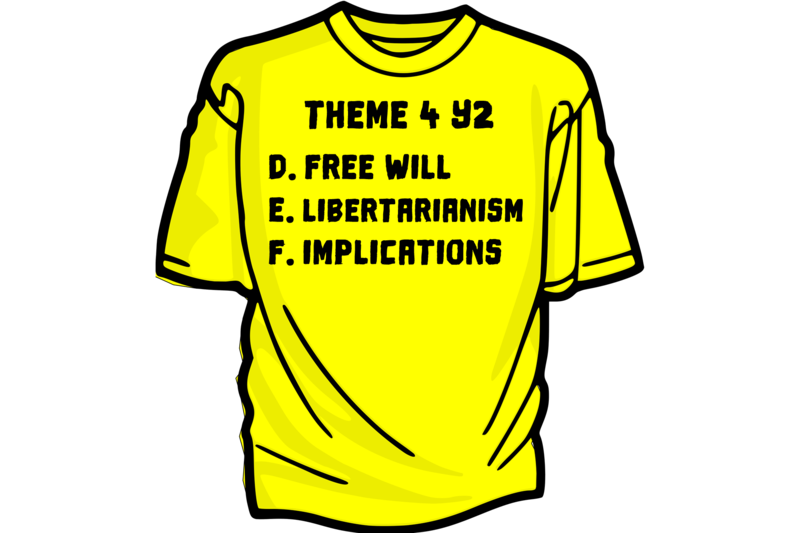 (b) To what extent does an individual have free choice? Whether you accept Calvin or Arminius, you still believe in that God who has both power and love. Predestination or free will may then influence how you rationalise those qualities, but it does not affect whether you believe God has them.